Market Timing: How good is good enough? In 1975, Nobel laureate William Sharpe published a study titled “Likely Gains from Market Timing”. 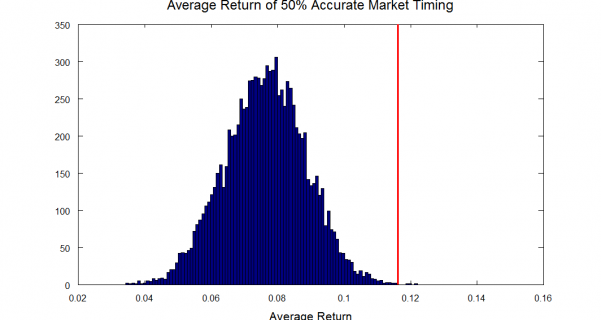 In this paper, Sharpe reportedly found that a market timer who switches between 100% stocks and 100% T-bills on an annual basis must be correct about 74% of the time (on average) to beat the market. Unfortunately, a free copy of this paper is not available on the web, and I don’t have access to this much cited paper. However, I’ve seen a number of related analyses based on Sharpe’s approach, and I believe we can recreate a similar result through simulation. In this post, I’ll simulate a simple market timing strategy and determine the market timing accuracy required to outperform buy-and-hold. I’ll compare market timing to buy-and-hold in terms of both total returns and risk-adjusted returns (measured by the Sharpe Ratio). I’m going to use market and T-bill returns for the years 1927-2010. My assumptions are that an investor makes a decision at the beginning of each year to invest in either stocks or T-bills, based on his/her prediction for the coming year. The Monte Carlo simulation is run using the actual annual returns for stocks and T-bills from 1927 to 2010, and 10,000 runs of the simulation are plotted to generate a distribution.